Compact and powerful, the 100-watt Katana KTN-Head delivers sharply defined rock tones with rich, commanding presence. The amp also includes integrated access to 55 BOSS effects, which are customizable using the free BOSS Tone Studio editor software. Up to 15 different effects can be loaded at one time, enabling you to build fully prepared sounds inside the amp. In addition, the versatile Katana KTN-Head is equipped with an effects loop and MIDI for integration with advanced rigs, and features a convenient built-in monitor speaker for tone preview and practice without a cab. Designed for guitarists who are serious about their sound, the Katana KTN-Head offers class-defying power and expressiveness to meet any playing situation. A special method developed for the flagship Waza amp optimizes the head’s interaction with your connected speaker cab, giving you authoritative punch and cutting presence previously attainable only with high-end amp designs. The compact size is easy to carry to gigs, jams, and practice sessions, and the rear panel is filled with lots of connectivity for interfacing with external gear. The amp’s built-in monitor speaker is also handy, letting you check tones and practice anywhere without having to connect to a cabinet. Sharpened to perfection by the BOSS engineering team, the Katana KTN-Head’s five amp characters offer everything from organic vintage tones to modern high-gain sounds. Clean is natural and transparent, while Crunch offers satisfying grit and response. Lead has a wide gain range to suit many styles, from fat, stinging blues solos to fluid legato shredding. With DNA inherited from the Waza amp, Brown delivers refined high-gain tone sought after by the world’s greatest rock players. The Acoustic character further enhances the Katana’s versatility, providing optimized tone that makes acoustic-electric guitars sound stunningly natural. With its built-in BOSS effects and recallable Tone Settings, the Katana KTN-Head lets you create fully prepared sounds for any song or style. Connecting to BOSS Tone Studio via USB provides access to 55 effects that are customizable for your needs. Going beyond standard distortion, delay, and reverb, the selection also includes powerful tone-shapers like pitch shifting, ring mod, slicer, and more. You can load 15 different effects in the amp at one time and use up to three simultaneously. Four Tone Settings let you store custom amp and effects setups for instant recall, and you can always jump to the current panel settings at the touch of a button. External control is also possible with optional footswitches, expression pedals, and MIDI devices. While the Katana KTN-Head includes many advanced features, it’s amazingly simple to operate. Dedicated knobs for multiple gain stages, three-band EQ, and presence allow you to quickly dial in your tone by ear, just as you would with a standard tube amp. Essential effects parameters are adjusted with a simple knob twist, and Tone Setting memories can be stored with a brief button hold. In addition to throttling back the volume for small stages and home playing, the Power Control has a Standby setting that mutes the sound for switching guitars or taking breaks. The Katana KTN-Head’s speaker out supports connection to your favorite 8-ohm or 16-ohm cab. You can also send a simultaneous direct feed to PA or recording equipment using the Line Out, which provides authentic mic’d up tone with power, fullness, and dynamics. It’s also possible to send the same mix-ready sound to your computer music recording software via USB. Advanced players will appreciate the effects loop and MIDI input, which enables easy integration with external effects and MIDI switching devices like the BOSS ES-8 and ES-5. 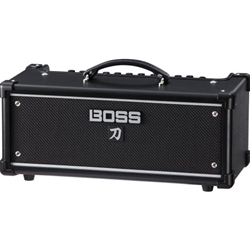 At the BOSS Tone Central website, you’ll find numerous free amp and effects setups for the Katana Series. Created by pro guitarists, these setups provide ready-to-play sounds for various music styles, and also make great starting points for building your own sounds. They load into the memories in a Katana amp via the BOSS Tone Studio editor software, which is also available at the site. In addition to Katana effects selection and customization, BOSS Tone Studio gives you a convenient way to organize all your Katana setups for different gigs, recordingsand practice sessions.